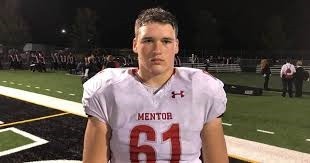 Mentor Ohio's offensive lineman Ryan Jacoby brings his skills to Ohio State as commitment number two of the 2019 class of recruits. His statistics place him at number 356 overall player, number 39 tackle for his class, and within the top ten prospects of the state, which in turn makes him a four star selection. The Ohio native opted for a local college over a long list of other institutions, including Michigan, Purdue, Northwestern, and more. His preference for the more local Ohio State and the Buckeyes is explained here in his comments. What Does Ryan Jacoby Have to Offer the Buckeyes? Jacoby and fellow new recruit, West Virginia's Doug Nester, are filling Ohio's very real need for offensive lineman in this recruiting class. The 6 foot five, 270 pound commit steps outside of the parameters of leaner and consequently faster linemen of Ohio State's prior years. With a fingertip to fingertip span that exceeds his height, Jacoby shows great promise. He's quick and can maneuver himself to stop linebackers and block players, even when distanced from the line of scrimmage. He has a versatility that could have him playing guard, or even tackle. His adaptability makes him a valuable choice who can fill a variety of roles.